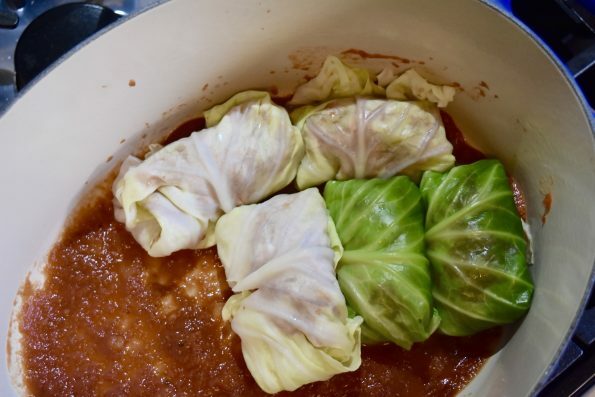 I have grown up eating stuffed cabbage from my mom’s old black dutch oven bubbling away on top of the stove for as long as I can remember. 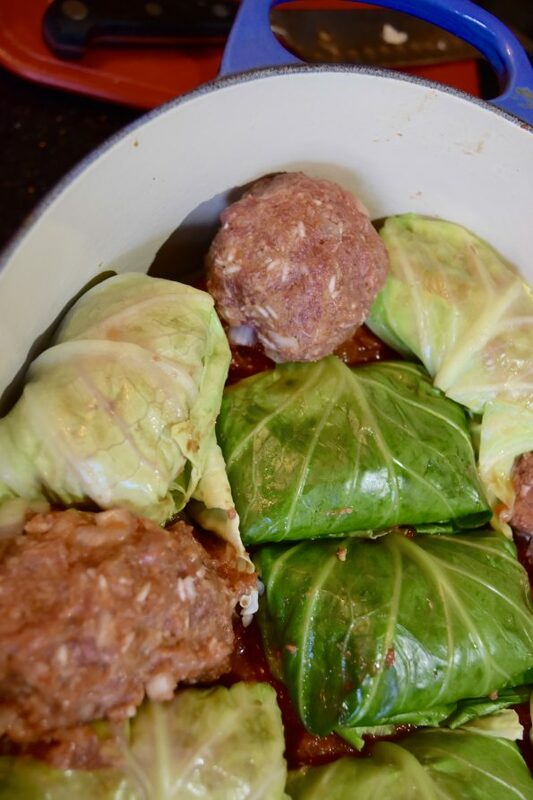 As a kid, I hated the cabbage, so she’d make a few “unstuffed cabbage” meatballs and serve those up along with white rice and lots of sauce. 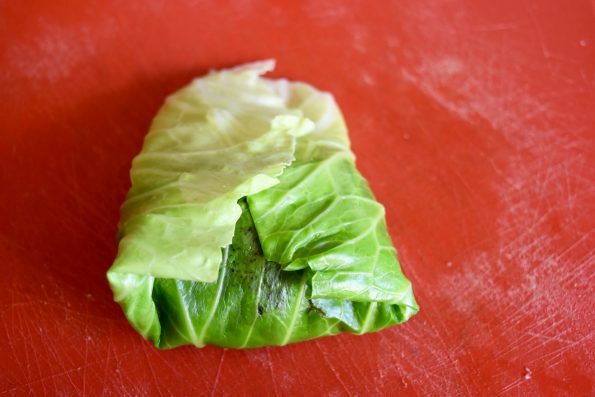 Fast forward a number of years, I met a guy with a similar Polish-Jewish heritage, who also grew up eating stuffed cabbage, known as holupski or golupski. I find myself making this recipe because it’s one of his favorites, but also because it freezes great, you can reheat one or two for a quick lunch or dinner, and it can be made well ahead of time if you are having guests over. Sure, it takes some effort to put the rolls together, but this kind of meal is totally worth it. This is old-world comfort food at its best. My mom always made hers stovetop even though the Good Housekeeping recipe (circa 1955!) calls for it to be baked, but to be honest (sorry, Mom! ), I’ve had a lot of luck with Ina Garten’s recipe. 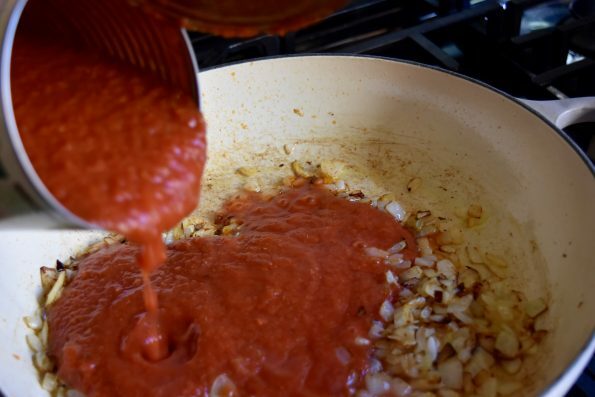 I tend to always have crushed tomatoes on hand – I rarely have tomato sauce. That was the deciding factor on which recipe I made tonight. 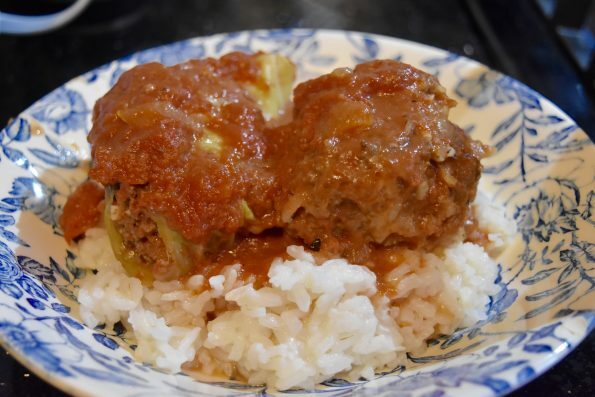 Both recipes are sweet and sour, the tanginess of the lemon or red wine vinegar set off by the brown sugar and the richness of the tomato sauce. 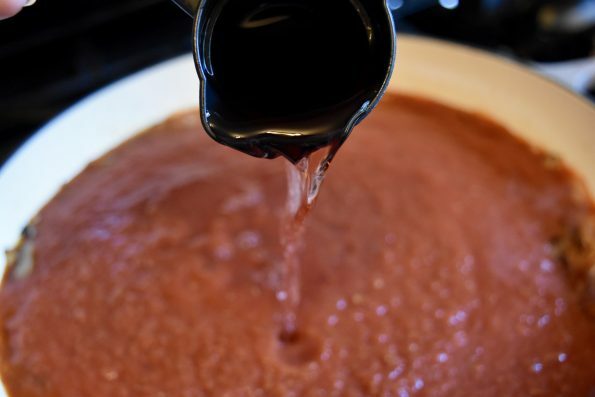 Simply combine in a bowl, and add 1 cup of the sauce, once prepared. Stir well, and proceed with stuffing. 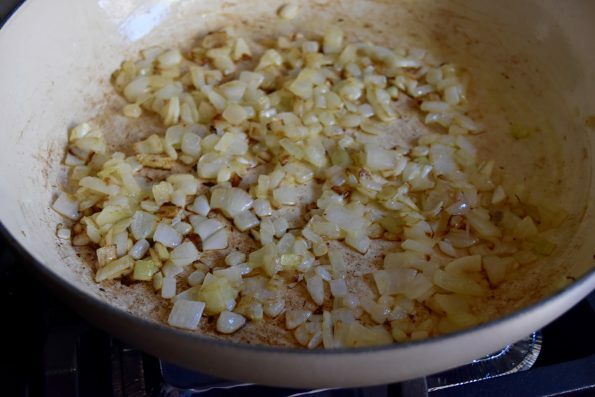 Heat the olive oil in a heavy-bottomed pot, and add the onions. Saute over medium-low heat until the onions become translucent and slightly browned, about 5-8 minutes. Add the cans of tomatoes, vinegar, brown sugar, raisins (if you’re using, I did not), salt, and pepper. Stir occasionally, simmering for 30 minutes. 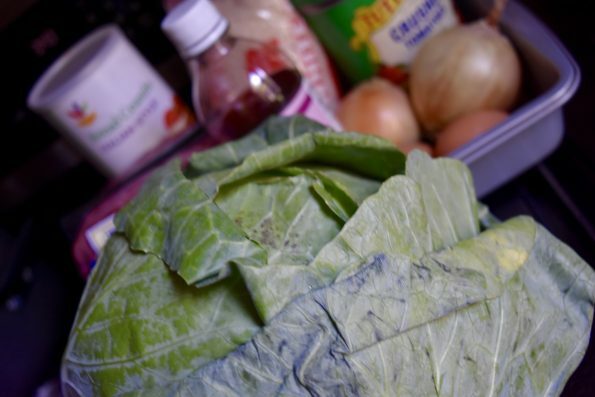 Once the sauce is simmering, bring a pot of water to boil, and carefully pull the leaves off the cabbage. 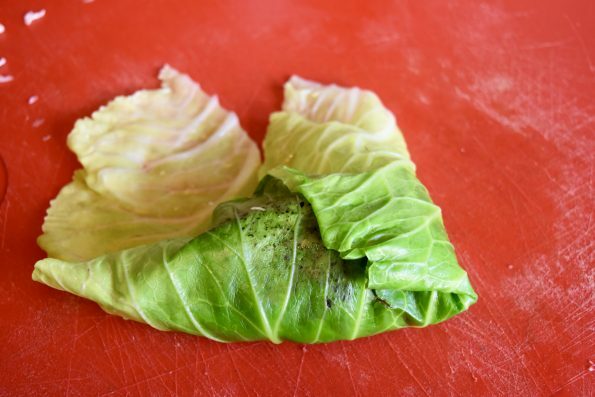 It helps to cut the leaves off the core and pry them off with a knife, being careful not to rip the leaves. 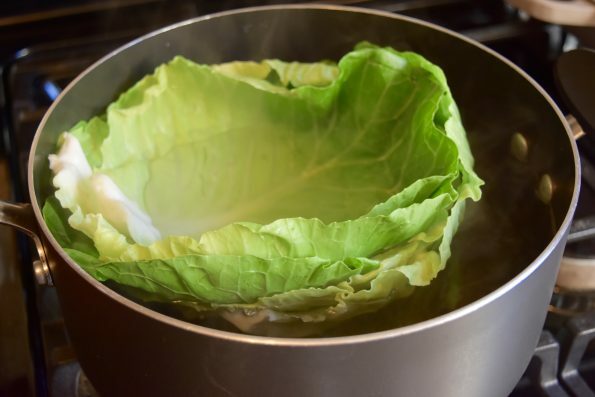 A few at a time, submerge the leaves in the water for several seconds, until the leaves wilt and become pliable. Drain, and set aside. 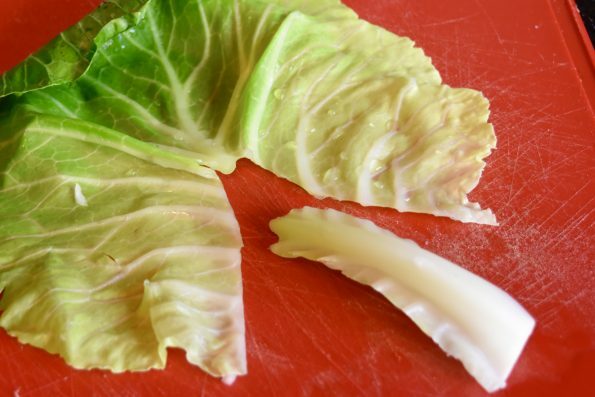 Take a leaf and spread it out on a cutting board. Cut out the rib, and discard. 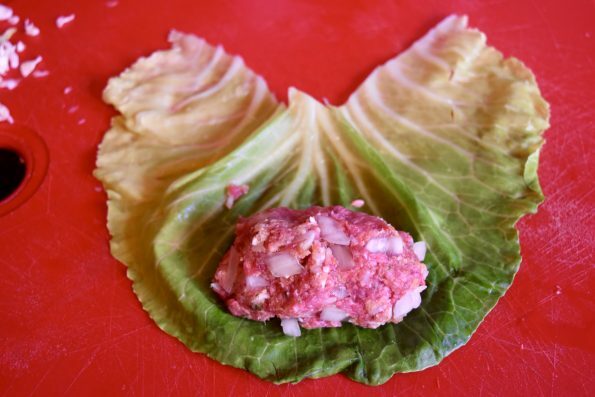 Turn the leaf over and place a “meatball” of approximately 1/2-1/3 cup on the rounded side, depending on the size of the leaf. 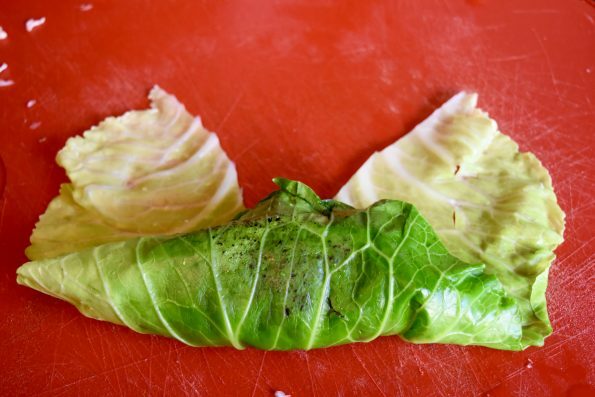 Roll the bottom up so that the edge of the leaf touches where the rib was cut out. 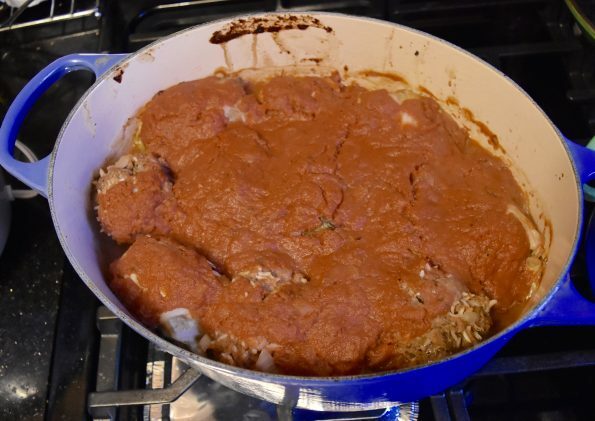 Next, fold in the sides in so that they are covering the meatball. 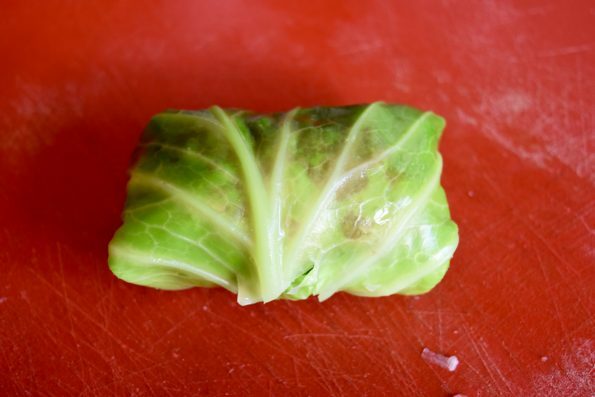 Finally, roll forward so that the leaf is now a packet holding a special, yummy prize. Some will look prettier than others, but that’s ok. Mama loves you too. It’s fine if the leaves are a little ripped, the filling won’t fall out. 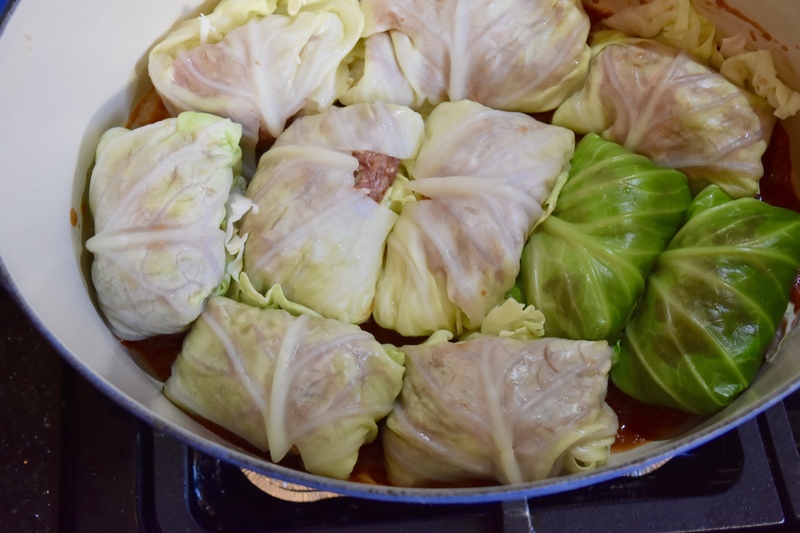 Place approximately a cup of sauce on the bottom of the dutch oven, and loosely nestle a layer of rolls in. With any extra meat, make meatballs and bring them to the party, if that’s what you’re into. Cover with another cup of sauce, and continue layering. When you’re done, cover with the rest of the sauce. Tightly cover the pot, and bake for 1 hour at 350 degrees. Serve with cooked white rice, and when plating, don’t forget to drizzle that wonderful sweet and sour sauce over it all. This recipe is wonderful because you can make this well ahead and refrigerate or freeze, and it heats up great too. I’d say this can make approximately 16-18 rolls and/or meatballs, depending on the size of the filling. That’s enough for dinner for the two of us, lunch for me tomorrow, and then another dinner or two!